As thousands of people prepare to descend on Chicago and march one day after Donald Trump's inauguration, there are some things marchers and residents alike should know. From transportation to potential street closures to timing, speakers and events. HOW MANY PEOPLE ARE GOING AND WHO IS ATTENDING? Organizers say up to 50,000 people are expected to be a part of the Women's March on Chicago this weekend. The march is said to feature a diverse group of demonstrators from around the city, including both men and women. Organizers say women and allies of women are being encouraged to march. A list of participating groups can be found here. 9:30 a.m. -- Musical performances begin. The music will continue at the rally site during the march as well. Originally slated to be held at the Petrillo Bandshell Saturday, the event will now begin at 10 a.m. on Columbus Drive near Jackson Drive. 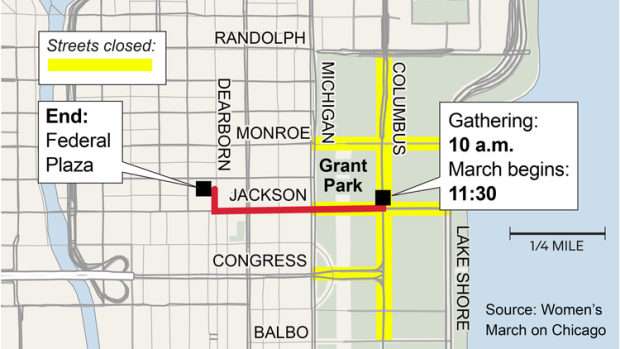 The event will begin with the rally near Grant Park, with the march expected to step off at 11:30 a.m.
Demonstrators will continue west on Jackson Boulevard before ending at Federal Plaza. From 9 p.m. Friday to 6 p.m. Saturday, Columbus Drive will be closed from East Monroe Street to East Balbo Avenue and East Jackson Drive will be closed from Michigan Avenue to Lake Shore Drive. Congress Parkway from Columbus to Machigan and Congress Circl will also be closed. Michigan Avenue will be closed from Randolph to Harrison once the march steps off, officials said. Organizer noted that East Congress and Balbo Avenue will also be closed from Michigan Avenue to Lake Shore Drive and Monroe will be closed from Michigan Avenue to Columbus, but those closures were not reported by Chicago's Office of Emergency Management and Communication. From Union Station: Passengers can board the 126 Jackson eastbound, exit at Jackson and Wabash avenue, walk east 2 blocks and west 2 blocks to Columbus and Balbo. From Ogilvie Station: Walk to Canal and Washington. 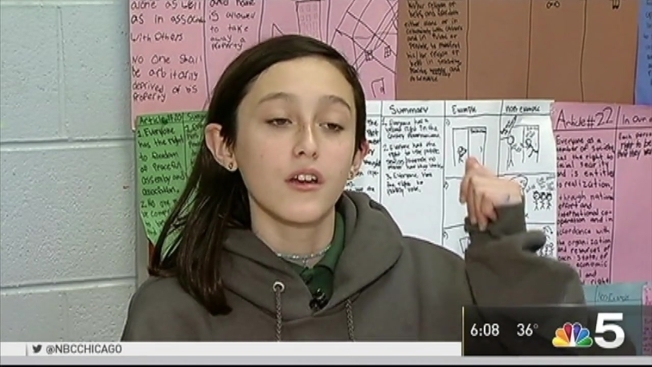 Take a J14 to Michigan and Jackson, exit the bus and walk south and east to Columbus and Balbo. From Millennium Station: Walk to Balbo, and east to Columbus. Alternatively, board a 3, 4, or 147 at Michigan and Washington southbound, and alight at Michigan and Jackson. Walk 1 south and then east to Balbo and Columbus. Parking: The Millennium Park and Millennium Lakeside Garages will offer nearby parking to the rally, with entrances on Columbus Drive, north of Monroe or south of Randolph. Other options for commuters looking for discounted rates include Bestparking.com and spothero.com. Metra is also expanding capacity on all lines Saturday to accomodate crowds expected for the march. That includes trains on the UP North, Milwaukee North, UP Northwest, Milwaukee West, UP West, BNSF, Rock Island, SouthWest Service and Metra Electric lines. There is no Saturday service on the North Central Service and Heritage Corridor lines. WHO IS SPEAKING AT THE RALLY? The long list of speakers features several people including Ari Afsar, Karen Olivo and Samantha Marie Ware from the cast of “Hamilton" as well as Hadiya Pendleton's mother Cleopatra Cowley-Pendleton. IS IT CONNECTED TO THE MARCH ON WASHINGTON? The Chicago event is one of many around the country and the world being held in conjunction with the Women’s March on Washington. "This march is just one moment in time but it’s a moment that will hopefully ignite a powerful message," said Donna Miller with Planned Parenthood. "Women are taking action and will continue to take action." The group noted it is not an anti-Trump event, but that many marchers may be marching for political reasons. "The incoming administration and president have promised an assault on women’s rights, we are prepared to fight back," said organizer Ann Scholhamer. The marches nationwide are expected to draw hundreds of thousands of people on Saturday.